Girlfriends are the best! Adventures with girlfriends are even better. 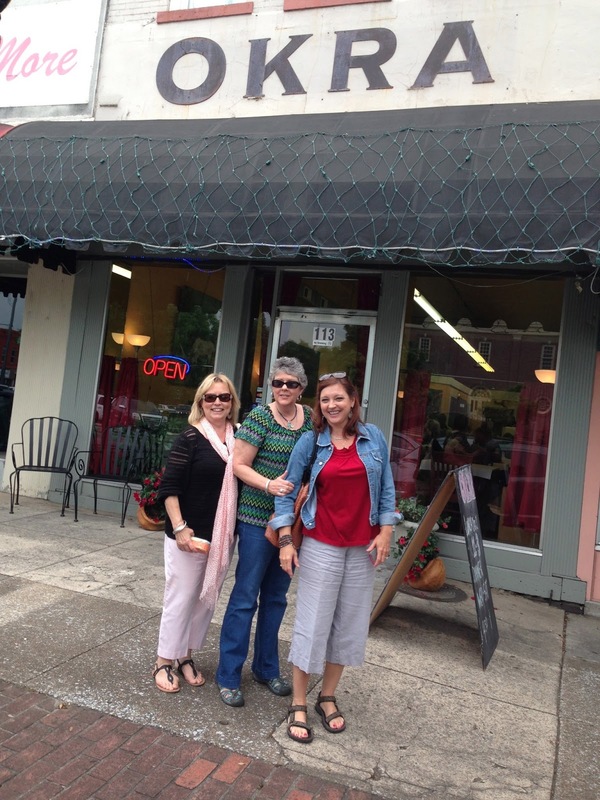 Culinary adventures with girlfriends....well, let's just say, "Sign us up!!" This new blog is devoted to three friends, Richi, Sherri and Luanne, and our culinary travel adventures. We will be traveling around enjoying each other's company, visiting some interesting places and sampling some local cuisine. We may also try our hand at duplicating some of the dishes we taste along the way! Since we are located in North Alabama, we will be starting in our tri-state area of north-east Alabama, north-west Georgia and south-east Tennessee. After that, who knows where we will end up! Will you join us? We hope so! 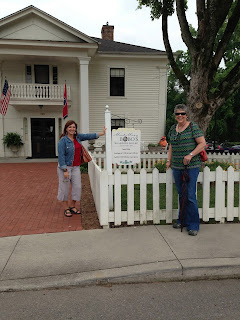 For our first adventure we decided to take a short lunch excursion to Fayetteville, TN to sample the offerings at a quaint little restaurant called, Okra. We got the tip from my mom, Sadie. She is always a great source of travel information! We set off on our trip and arrived in Fayetteville at around 10:30...about 30 minutes early for lunch, so while we waited we walked around the town square and checked out some of the shops. When we finally crossed Okra's threshold, we were hungry and curious! The first thing we noticed was a huge chalkboard with lots of vegetables and sides. The waitress came over and seated us and took our drink order. We all chose the ginger-mint iced tea. Good choice! It was not too sweet, but sooooo refreshing! Now we were on to the hard part...what to have for lunch? In addition to the chalkboard of tempting offerings, the waitress gave us menus with even more choices. Did we want a sandwich or dish from the menu or a meat and three or veggie plate from the board? Hmmmmm? Luanne knew what she wanted before we sat down, because while we were shopping, a saleslady in one of the shops told us Okra served a great fried green tomato BLT with locally made market bacon. As soon as she heard that, she was sold. Sherri and I had a little more trouble deciding. The meat choices for the blue plate special were herb roasted chicken, fried catfish and pulled pork. I was debating on a blue plate or a pulled pork bahn mi sandwich that I had spied on the menu. on the board all just sounded so good. 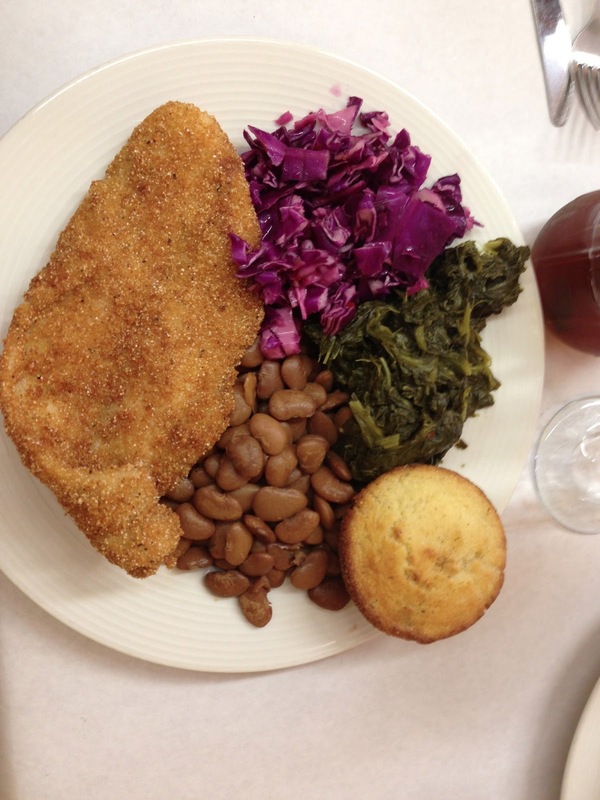 With my catfish I decided to have butter beans, turnip greens and a sweet and spicy slaw. More about that slaw later. Sherri also ended up choosing the catfish and the sweet and spicy slaw, but she included buttered new potatoes and fried okra. Both of our plates came with cornmeal muffins. The waitress asked us if we wanted butter for our muffins, which we did. The funny thing was, she came back with three little cups of butter. Each cup had a slice of butter so thin you could see through it. Either they were almost out of butter or they took one look at us and decided we did not need any butter. I don't know how they sliced off such a tiny amount of butter! As for the slaw, we actually had to choose between the sweet and spicy or buttermilk. The waitress explained that the buttermilk variety was creamy and the sweet and spicy was vinegary. When the plates arrived, we also noted that the sweet and spicy version was made with purple cabbage rather than green. It added a pretty pop of purple to our plates and it tasted good with the other veggies, too. I'm not sure you would want to sit and eat a bowl full of it by itself, but with the other vegetables and the catfish, it was quite tasty. The catfish was crunchy on the outside and moist on the inside. My butter beans and turnip greens were also great. Sherri said the potatoes and okra were very good as well. As for Luanne's sandwich, she said she really liked it and she was especially pleased that the waitress remembered to tell the cooks to leave all condiments off her sandwich. Weird, I know, but my buddy, Lu, doesn't do condiments. Lu was happy, though, and that is what mattered. She also said the sweet potato salad with roasted sweet potatoes and apples, that she chose as a side to her sandwich, was good. All in all, we loved our meal, but we all agreed the ginger mint tea was the bomb! So refreshing! As we were finishing up, we noticed one of the other diners had ordered the pulled pork bahn mi, the sandwich I had agonized over. It looked amazing and the lady let us take a picture of it. She told us it was really good, so I decided we would have to come back to Okra sometime so I can try it out. We left Okra, full and happy, but not quite ready for our day to end, so we decided to head over to nearby Lynchburg, the home of Jack Daniel's Tennessee Whiskey. We had all been to Lynchburg before and all of us had toured the distillery, so we decided to just walk around the town square and enjoy the gift shops. Lynchburg is an interesting town. Even though it is home to a famous distillery, it is located in a dry county, so no alcohol is served there. Do you remember the Waltons and the little old ladies who made their own liquor, but they would never admit that is was liquor? They called it "the recipe"? Well, in Lynchburg, Jack Daniel's is called "the local product". And believe me, even though they cannot give you a drink of "the local product", they put the product in everything else. At Miss Mary Bobo's boarding house, meals are served two times a day, family style, and one of the most popular dishes served there are apples cooked in "the local product". we found room for a sample of some fudge at a sweet shop on the square. PS. If you visit Fayetteville and happen to have a bite at Okra, or Miss Mary Bobo's in Lynchburg, stop back by here and let us know what you thought! 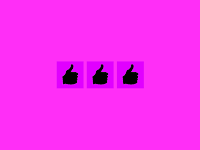 I can tell that I'm going to be enjoying this little blog that my three friends are creating. Can I tag along and carry your fork if I promise to be good? Oh, absolutely! But forget the part about being good! You be just as bad as you want...you can never be as bad as Sherri! :) thank you for leaving our first...and hopefully not last....comment.